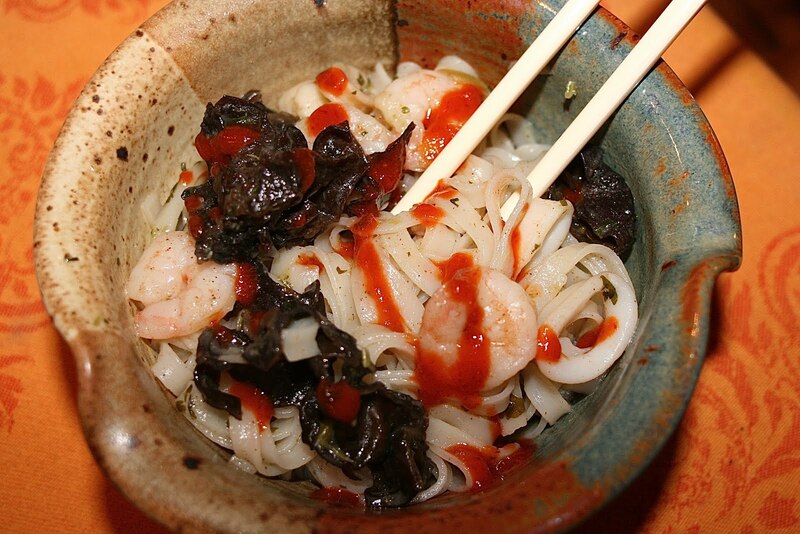 I read through Dorie Greenspan's recipe for Shrimp & Cellophane Noodles several times. 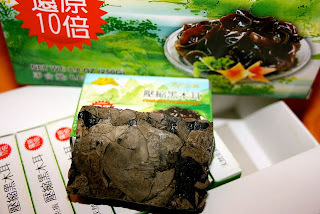 I was really intrigued by the Chinese Tree Ear Mushrooms which came in a large box filled with tiny packets of mushrooms that looked like hashish. (I spent a little time in Istanbul, needless to say they don't just smoke tobacco in their hookahs). Everything about the recipe was appealing except: the tomato puree. I just could not put tomato sauce in an Asian dish. I dipped a noodle in a little bit of ketchup... not a totally fair comparison, but yuck... I couldn't do it. So I made my own adaption of this recipe without the tomato puree... and it was wonderful. The Chinese Ear Mushrooms have a very mild flavor and a super interesting texture that did not over power the seafood (I used a mixture of squid, bay scallops and shrimp). Cilantro was key for blending all of the ingredients together and the touch of toasted sesame oil added depth to the dish. 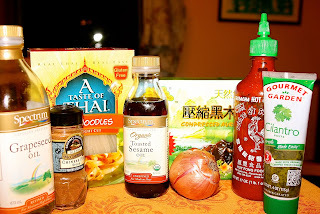 My family loved adding their own chili sauce. The heat of the chili sauce was a direct contrast to the cool mellow flavor of the noodles...it worked extremely well. 1) Put dried mushrooms in a bowl with 2 cups of water and microwave them for 3 minutes. Let sit in water until ready to chopped them. 2) Bring a large sauce pan of well salted water to a boil. 3) While waiting for the water to boil heat on medium-high the Grapeseed oil in a large skillet or wok. Saute the onions, and garlic until wilted. Do not brown the garlic. 4) Chop the mushrooms and add them to the skillet. Cook for a minute and then remove all vegetables from the pan. Set aside. 5) Mix the Chinese-five-spice powder with the sugar, salt and cayenne pepper. 6) Put the seafood into the skillet on medium high and coat it with the spice mixture. Cook for about 1 minute or until the fish is opaque. 7) Add vegetables back into the skillet and remove it from the heat. 8) When the noodles are cooked pour them into the skillet and mix them with the vegetables. Add the toasted sesame oil and cilantro. 9) Individually garnish with hot chili sauce to taste. Except for the seafood, our dishes look exactly the same! I could't bear to add the tomato sauce either, haha! Yeah,,, I was worried I would be alone in this decision. this goes beyond my lame cooking skills! looks tasty tho! stopping by from the gyb hop! You would be surprised. It really isn't hard to make. Just cook the noodles for the minimum time recommended so they don't get soggy when mixed with everything else. Oh, how I wish I had called you or Maya before totally ruining this week's recipe. I used the very same noodles that you did, Diane. I would have been happy to just eat the noodles mixed with a touch of toasted sesame oil. And, yes, the entire dish without the tomatoes would have been fine. I ended up picking the shrimps out of the bowl and making a tortilla wrap. Now that was good. I so looked forward to this week's recipe but, wow, was I in for a surprise. I am glad you adapted the recipe as it should have been made. I was in Istanbul for just a day, seeing a few highlights. I thought it was a facinating city where I would like to return. It is so hard to deviate from a Dorie recipe... sometimes I am so surprised by her combinations even though I doubt them right down to the end. Smart move making the tortilla wrap at least you salvaged something. Yes, Istanbul is an extremely interesting city... my older sister used to belly dance and I went there with group of belly dancers from NYC... what a time!!! Yes, I think this would have been very lovely without the tomato puree. A bad dish on top of a rough week... sorry Cher. I found my husband eating it with tabasco sauce the next night, so I will have to tell him about your success. :) Cute post. The man has good instinct. Nice adaption! This one was just a bit on the strange side. I had no idea what to expect. I'm glad I added a tiny amount of tomato now. But a little went a long way! Your dish looks so pretty! I wish mine had looked so good! Wise only adding a little tomato... it probably was fine with a tad. Thanks you for the compliment of the dish's looks. Maybe the short time I lived in Chinatown NYC paid off. I actually ordered the mushrooms on Amazon. Yum! I love the addition of scallops & squid! Your recipe is definitely better. Angel hair pasta has so much more flavor. Diane, this looks like a fantastic Seafood dish that we will just love. Hope you have a great weekend and thanks for sharing your tasty recipe with Full Plate Thursday. Sriracha, the magic sauce. Good idea! Glad you liked this. You had plenty of friends who didn't use the tomato sauce either. I enjoyed it, but only used 1/4 cup tomato puree. It really married well with the five-spice and cayenne, I thought, but didn't make the whole dish soupy. It was even good cold! I'm surprised you could still taste the seasoning... good to hear. The ear noodles do have a unique texture... classic of what I think of in Chinese cooking. I really wish I had chosen NOT to add the puree. But the shrimp, 5 spice, and 'shrooms were really good!!! Yours looks sooo good. Such a hard call.. so many times Dorie has surprised us for the positive. Hi Diane! Very nice adaptation!!! and I completely agree about the hookah "additions" while in Istanbul! Have a great weekend! Oh boy can you smell it when you pass those little hookah hang outs. I found the cab drivers to also have a glazed look over their faces and a tendency to get lost... though that may be just a trick to get a tourist to pay more. looks like you enjoyed this one quite a bit! Love that you put in other seafood too! Mussels were a good call in your dish... they can stand up to tomato sauce. Diane, looks like the lovely additions that you made to this recipe and the fact that you left out the tomato purée made all the difference. Glad to read that you and your family really liked this recipe! I made quite a few changes to this dish as well and all my taste testers seem to have been happy with their Asian style lunch. It's good to go rogue sometimes. Great adaptation! I left out the tomato, changed the noodles, and used fresh wild mushrooms in place of the black fungus. I'm intrigued by those mushrooms, though. They sound like they added a nice texture to the dish. The tree ear mushrooms aren't as flavorful as fresh mushrooms, but they have an interesting texture that may or may not appeal to Americans. I was told by an Asian friend that texture is appreciated as a nuance in Asian cooking more so than in European cooking. Your version sounds wonderful! I ended up following the recipe and we liked it! Those mushrooms are interesting! What a really great idea to add the Sricacha. Wish I had done that instead! Looks great! I bet the added seafood enhanced the overall dish. While I used the puree, I could see adding far less of it then what the recipe called for. This looks delicious. I can't wait to try. I like your take on this recipe - it looks really delicious, and has a great balance of spices. Thank you for sharing this post with the Hearth and Soul hop. My guess is that you would really enjoy the flavor mix of these noodles. I don't think, I would like the tomato with this either. 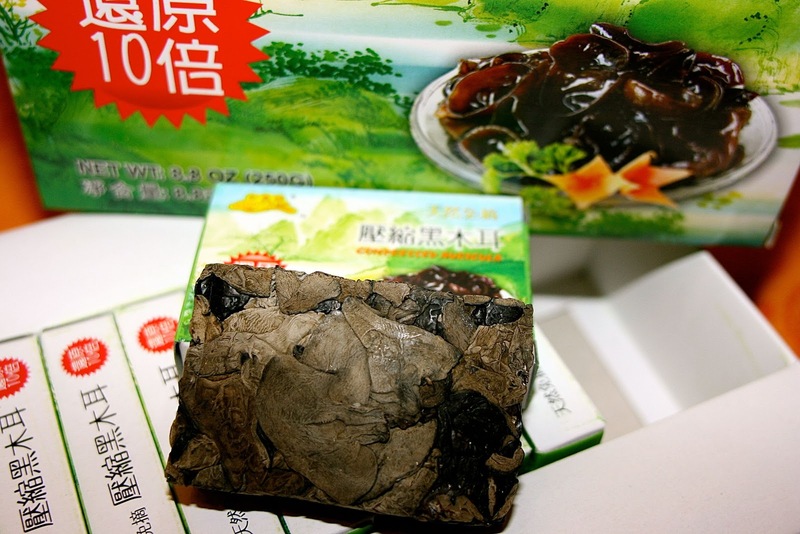 It looks great and I love the use of the Chinese Five Spice. It is one of my favorites. I agree on the 5 spice I'm always looking for dishes that it could work in. This looks wonderful! Thanks for sharing your recipe with the Hearth and Soul Hop. I’ve pinned it because I am trying to find more recipes using shrimp.